The Verkhovna Rada of Ukraine has passed a law banning Russian nationals and persons suggested by the Russian party to serve as official observers in the presidential, parliamentary, and local elections in Ukraine. 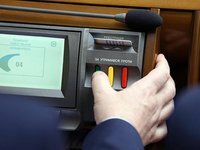 A respective decision was supported by 232 MPs at a plenary session of the parliament on Thursday, a correspondent of the Kyiv-based Interfax-Ukraine news agency reported. The new law amends three laws: "On the election of the president of Ukraine", "On the elections of People's Deputies of Ukraine" and "On local elections". According to the law, a citizen (subject) of a state, which is recognized by the Verkhovna Rada as an aggressor state or an occupier state cannot serve as an official observer from foreign states and international organizations. In addition, the person suggested by an aggressor state or an occupier state cannot serve as an observer. As earlier reported, on February 4, bill No. 9524 "On Amendments to Certain Laws of Ukraine Concerning the Observation of the Electoral Process in Ukraine" was registered in the Ukrainian parliament. According to the text of the bill, a citizen (subject) of a state that is recognized by the Verkhovna Rada an aggressor state or an occupier state cannot serve as an official observer from foreign states, international organizations during the presidential elections, parliamentary or local elections in Ukraine. The explanatory note says that the bill was developed "in order to minimize the risks and threats of interference of the Russian Federation in the conduct of elections in Ukraine." Chairman of the Verkhovna Rada Andriy Parubiy, First Deputy Speaker of the Parliament Iryna Gerashchenko, the president's representative in the Parliament Iryna Lutsenko, leader of the Petro Poroshenko Bloc faction Artur Herasymov, and First Deputy Chairman of the People's Front faction Andriy Teteruk are among the initiators of the document. Earlier, the OSCE/ODIHR sent to the Ministry of Foreign Affairs of Ukraine an electronic list of long-term observers for the March 31 presidential elections, which included two candidates from Russia—women born in 1990 and 1985. On February 7, U.S. Special Representative for Ukraine Kurt Volker said he is not against Russian observers being allowed to monitor Ukrainian elections. "Ukraine needs ODIHR monitors to prove it adheres to democratic standards. Otherwise allows people to question election," Volker said in a tweet on Twitter on Thursday. "OK if Russian monitors are part, but under ODIHR authority. No games," he said. The U.S. special representative for Ukraine said Ukraine "needs to have confidence in its own democratic institutions."